In this day and age where home buyers look at the Internet first when buying a house, investing your time, resources, and effort on a real estate website should be non-negotiable. This is due to the fact that a real estate website will be able to provide information on the properties that you have for sale and the services that your company offers. In this article, we will detail how to use your real estate website to your advantage. On top of that, there is also a detailed step-by-step process on how to create a free real estate website in Asset Column, which you can use for the benefit of your business. There are several benefits to having a real estate website. First, you get to create your own brand that is separate from your real estate company. Moreover, your listings will have an avenue for marketing, which makes it more accessible to local buyers. In turn, this marketing strategy can lead to better sales for your business. Due to the present technology available for everyone’s use, it is important to have your presence felt over the Internet. Your real estate brand should be made available over the Internet since you do not want to just be associated with a real estate company. On top of that, if you want to rake in more income, you should be your client’s only option. If you are associated with a real estate website, your client may find another real estate agent in your company website. When you have your own real estate website, you will be marketing yourself and not the company that you work for. This way, you would not just be another face that is advertised with other real estate agents on your company website. In addition to this, a real estate website adds to your credibility and authority in the real estate business. You can present yourself as a legitimate real estate agent since you have your own website that is in your name. With your own real estate website, you will be your own brand and you do not have to worry about the competition. However, the properties website can also be used by real estate companies or real estate brokers. Since the Internet is the primary source of home buyers in searching for their home, it is important to have a properties website. When you want to be the leading real estate agent in your area, a real estate website will allow you to focus your buyer search on your area. You have to prove that you are the best in your area for real estate properties by having an avenue where you can showcase the properties that you sell. With a properties website, it is easier to be in contact with potential home buyers. Since your real estate website makes it easy to contact you, you can get immediate offers on the properties that are up for grabs. In addition to this, it is easier to convert leads into sale since your properties are easily viewed and accessed by real estate clients. Without a properties website, it is harder to get a hold of clients that are genuinely interested in the property for sale. Unlike the olden times where you advertise the properties for sale over the newspaper, it is easier to have a proper marketing strategy for a real estate website. You will easily have an avenue to market properties, which allows for a higher chance of conversion due to the increased visibility of the real estate properties up for sale. You do not have to print out papers and post them in every corner just to make sure that a lot of people can see them. All you need to do is update your properties website and you will have a strong advertising strategy. What Makes a Great Real Estate Website? A real estate website should not be like all others. You must do something to ensure that your brand is able to stand out from your competition so that you will have an edge over competitors. With a great website, you will be able to increase the trust of your clients and you can even gain credibility. Since first impressions last, it is important that the appearance of your website is both professional and appealing. When you have a greatly designed website, you will be able to gain the attention of the site visitor. In addition to this, it can also add to the credibility of the site and appeal. Moreover, the site should not carry overly colorful designs as it may appear unprofessional. The best design for a real estate website would be a minimalist design that can avoid the cluttered appearance of your data. On top of that, the texts must be readable and easy to view. Most home buyers nowadays will begin their search for a home with the use of their gadgets, whether it is a mobile phone or a tablet. Your real estate website should carry a responsive design so that it is easy to view the properties with your phone, tablet, or home computer. With a page that has a responsive design, there is a higher opportunity for sales since you are available for all types of technological platform. The wider your client reach, the better the chance of conversion for your page. In order to increase the appeal of your site, it must be highly beneficial for the potential home buyers. Apart from the usual information found on most real estate websites, you can add in a Mortgage Calculator that can guide the user on how to compute for their potential mortgage. You can even add a section for home buying tips and maintenance tips of their homes. 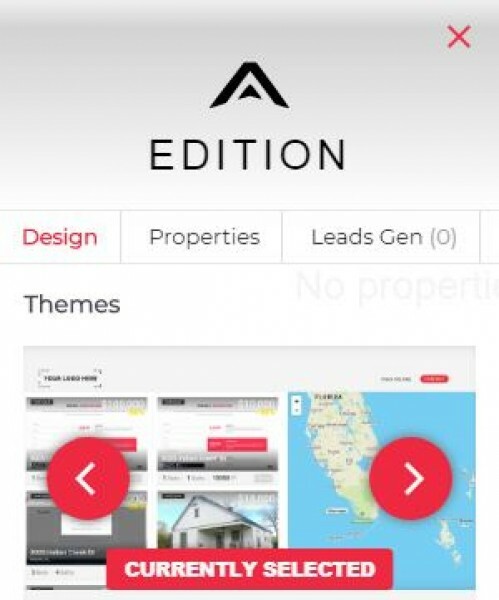 Before proceeding in making your own real estate website, you can also choose to sign up with a free account with Asset Column since it will make it easier and more convenient for you to create your properties website. Apart from the free real estate page, there are several other benefits to signing up for your own account with Asset Column. Once you have your own account, you will be provided with a temporary URL for your website. You do not have to worry about anything since signing up for an account with Asset Column is free. Now that you have set up your account, you are entitled to all the benefits of a free account of Asset Column. One of the first things that you need to do is to set your own User Identifier. You have to be careful in selecting it as you can only change your user identifier once. In the section for My Identifier in your newly created account, there will be a suggestion given to you, but you can choose to edit it. There will also be an indicator if that username is already taken by another account owner. This is how your identifier will track your website. If your username is aprilleavancena192, your website will appear at www.assetcolumn.com/m/aprilleavancena192/deals. You can send the link to potential buyers in order for them to easily access your properties website. There is an option to edit your website and the design of your webpage. Moreover, you can choose how to be notified if you have leads. There are several other benefits apart from the properties website and you can explore your account freely to check on these benefits. You can also share a link to your website on social media sites to inform your followers and increase your presence on the World Wide Web. On top of that, you can connect your domain to your properties website. You just need to key in your domain name. If you edit your website, this is how it will appear. In the designs column, you can choose the theme that you wish to use for your site. A free account would only entitle you to a basic theme, but a pro and guru account would allow you to choose more designs. This means that you have more options to choose from when you wish to edit your properties website. This is how a bare properties website will look once you are done creating your account. It is now time to advertise the real estate properties that you have for sale. You can even add in your company logo to ensure that you will be set apart from other real estate agents. In addition to this, you can choose which properties can go in first on your properties website. You can even check on the leads that you have generated on your page. Step 6: Welcome to your Properties Website! This is how your website will appear when there are no properties available at the moment. You can edit it freely and switch up the design and text on the website. Once you have posted a property, it will also show where the property is located for easy tracking of potential home buyers. You can even track the number of leads that you have generated on your website. Since you can post as many properties as you wish, the option for conversion of leads is also unlimited. There is more option to gain income if you have the chance to advertise as many properties as possible. Apart from the benefit of a free properties webpage, you can explore more free features when you sign up with Asset Column. 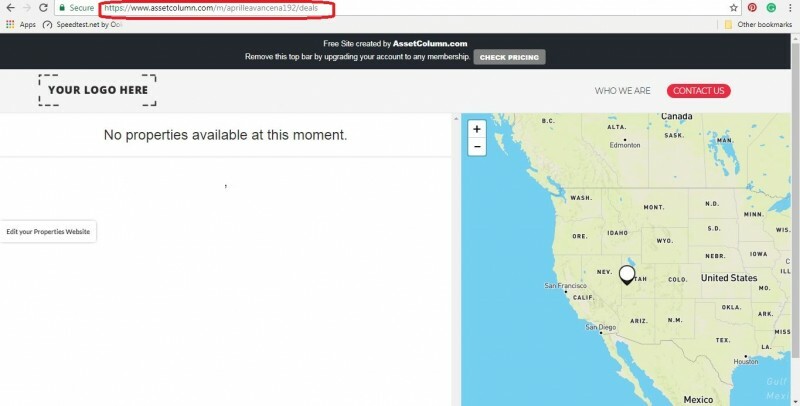 In order to convert income without spending a lot, you can check out the free real estate website option of assetcolumn.com.